Some great technology but its colour range leaves a lot to be desired. Assembling and using this projector was an absolute pleasure! You wouldn't get a better price than this for a 4K projector. Summary: Overall, we feel the ViewSonic PX747-4K projector was designed specifically for people who have a budget of around $1000 and are keen to test the 4K waters. There are several better options but this projector is better than you would expect at its price. For years, the main factor that has been keeping quality 4K resolution projectors out of the hands of all consumers has been the price. While cutting-edge technology will always carry a hefty price tag, the fact of the matter is that 4K is almost three years only at this point. Yes, it is still the highest resolution that is available to most consumers, but still – prices will have to decrease eventually, right? Thankfully, the ViewSonic PX747-4K projector represents the most affordable 4K projector ever created, with a price point that is just north of $1,000. Technically, there are two versions of the ViewSonic PX747-4K family available, with the other option formally known as the ViewSonic PX727-4K. The differences between these two units are minimal, with the ViewSonic PX727-4K sporting an RGBRGB wheel and ViewSonic PX747-4K outfitted with an RGBW wheel. This brings up the question: What difference do these different colour wheels make? In short, not much, as these two colour wheels present a small trade-off when it comes to the overall colour brightness seen by each unit. Other small differences between the two models exist in areas such as lumens (rated 2200 lumens for the ViewSonic PX727-4K versus 3500 lumens from the ViewSonic PX747-4K ), but only a well-trained eye will be able to really spot these minute changes. Since the difference between these two models is minimal, we will solely focus on the ViewSonic PX747-4K throughout this review. However, readers should note that many of the benefits (and critiques) associated with the ViewSonic PX747-4K can be applied to the ViewSonic PX727-4K. So, if you want to avoid researching another projector option, feel free to consider these two models as projector “cousins” from the ViewSonic line of products. Everything discussed within this review that applies to one model applies to the other – including the price. Who is the ViewSonic PX747-4K For? As the ViewSonic PX747-4K is a standard throw projector intended for use cases where there is quite a bit of distance between where the projector is placed and the screen, this unit can only be put to real use in larger settings. This limits the application of the ViewSonic PX747-4K to large home theatres, spacious offices or boardrooms, and other such environments, such as lecture halls. With such realities in mind, the ViewSonic PX747-4K is really for whoever has enough space to put it to good use. Representing one of the most affordable 4K projector options on the market today, the good outweighs the bad for those who can accommodate a standard throw-style projector such as the PX747-4K. However, we urge our readers to consider the fact that this projector does not output true 4K resolutions. Instead, it utilizes a technology called XPR, which basically uses lots of tiny mirrors to improve an image’s apparent resolution. To the untrained eye, the resolution output by the ViewSonic PX747-4K is the same as any high-end projector. On the other hand, if you have grown accustomed to true 4K resolution, there may be some minor complaints to be had. Generally, the ViewSonic PX747-4K is a fantastic option for those who have enough space, are looking to purchase an extremely affordable unit, and are willing to sacrifice true 4K resolution for the next best thing. If you think that the PX747-4K isn’t the right projector for you, no worries! 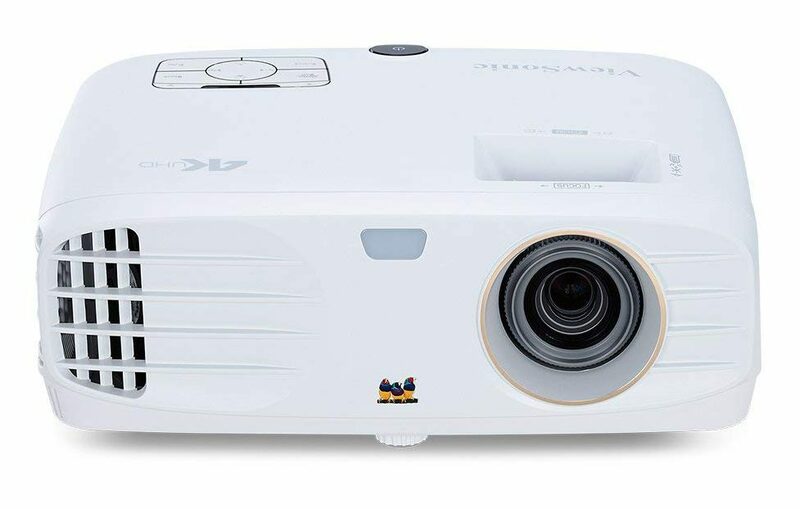 We suggest you either check out some of our suggestion for an alternative to the ViewSonic PX747-4K (see below) or check out our list of the best 4K projectors available in the marketplace today. What Unique Features Does The ViewSonic PX747-4K Offer? ViewSonic is known for making extremely affordable and functional projectors, but they do not have the best reputation when it comes to including cutting-edge features within their products. This makes sense, as many products like the ViewSonic PX747-4K are intended to be budget projectors that help these great devices to become more accessible to everyone, regardless of their budget. HDR10 support through a full-bandwidth: In other words, the ViewSonic PX747-4K is capable of playing all HDR content flawlessly, and can sometimes even improve the quality of non-HDR content, as many users have noted as a result of their own personal use of this projector. Built-in 10 Watt Speaker: Sometimes, it is the small and simple details that can help a projector to really stand out from among the crowd. With a powerful 10 Watt speaker onboard the ViewSonic PX747-4K, the output of audio should never be an issue. Many users prefer to hook up their projector with a hi-fi audio system (which is an approach we highly suggest if your budget allows for it! ), but rest assured that the speakers within the ViewSonic PX747-4K are more than capable of handling your basic audio needs. Form factor and build quality: Features like a small form factor and excellent build quality are not groundbreaking by any stretch of the imagination. However, we have seen far too many affordable projectors that lend themselves to cheap design and manufacturing. When you are investing in a piece of equipment as expensive as a projector, you want to know that it will be durable for years to come. With the PX747-4K, you are getting the always strong build quality of ViewSonic at a price that doesn’t break the bank. In our eyes, this is a great combination. Backlit remote: Once again, ViewSonic is able to make their affordable products feel premium by paying attention to the littlest of details. Backlight for remote control is by no means innovative, but we must say, it can come in handy, especially when using a projector like the ViewSonic PX747-4K in a dimly lit room. After all, how many times have you gone searching for your remote while enjoying your favorite content? We know we have fallen victim to this common annoyance, and are glad to see the inclusion of a backlit remote with this device. Since rising to the top of the affordable projector market, ViewSonic has done a great job of offering strong products by getting the basics right. While none of the features highlighted above are winning any awards for innovation or inventiveness, such details can make-or-break a projector at this price point. Thankfully, we are happy to report that by and large, the ViewSonic PX747-4K is a very reasonable projector for its price. Yet, like any budget projector, it has some quirks and flaws that are worth noting. To give our readers a full understanding of what the ViewSonic PX747-4K has to offer, we will be focusing the following section on some of the pros and cons provided by this projector. What Are Some Benefits And Downsides For The ViewSonic PX747-4K Projector? When shopping for a budget product, customers typically understand that some tradeoffs must be made, whether in the quality of the product or its included features, in order to ensure a rock-bottom price. Shopping for an affordable projector is no different, with each device in the $1,000 price range having its own unique set of flaws and downsides associated with it. This isn’t to say that affordable projectors must present customers with a lose-lose scenario. Very user-friendly: From a straightforward installation process to an accessible and easy-to-understand Settings menu, the ViewSonic PX747-4K provides users with an approachable experience. It is clear that ViewSonic dedicated a lot of time and attention to the user experience, which is apparent with the addition of things like a backlit projector remote. Ultra-long lamp life: Rated for up to 15,000 hours of use, there is little-to-no need to worry about replacing the projector lamp bulb for a very long time. While lamp life can vary significantly depending on factors like usage time, brightness, and other settings, most users will not have to worry about lamp life for the life of their projector. Even those who use their projectors for hours a day are in good shape, as extra lamp bulbs are very affordable and the installation process is quick and convenient. Impressive brightness: Throwing out an output of a 3500 lumens rating, the ViewSonic PX747-4K is a great projector for those who will be using their unit in dark-to-moderately bright settings. The image appears bright and crisp in low-light environments, and can still be seen pretty well in brighter rooms with ambient light. However, if you are looking to use your projector in direct sunlight or a brightly lit space, you may want to look elsewhere. While the brightness level is impressive for a budget projector, it is not enough to deal with use cases such as these. Impressive use of pixel-shifting technology: In reality, the ViewSonic PX747-4K only outputs 1080p resolution. To bump this up to near-4K, pixel-shifting technology developed by the team at Texas Instruments is utilized. This is accomplished by having the projector’s mirrors, which only amount to one-quarter of 4K resolution, display four different pixels worth of resolution in rapid succession. As it is done extremely quickly, our brains are unable to perceive this nifty trick actively, so we end up interpreting the overall image as 4K resolution. In other words, this novel approach allows for 4K quality resolutions to be made available at 1080p prices. Lack of HDMI ports: With only two HDMI port onboard, users will either be forced to invest in an HDMI hub/receiver or manually change which source is connected to their ViewSonic PX747-4K by hand when using more than 2 HDMI sources. Either way, this is a pain and quite honestly seems to be an unnecessary flaw that could have easily been fixed. Black frame around images: This is a common issue with near 4K projectors at this price point, as it is a product of the pixel shifting technology utilized by these devices. If you are projecting onto the right surface, the thin black frame that forms around images isn’t as noticeable. However, when combined with just the right shade of white or black, projecting on certain surfaces can turn into a distorting mess. Unimpressive colour range: This is more of a concern for videophiles, but some users have reported that the colour range of the ViewSonic PX747-4K feels a bit washed out when compared to other projectors. With this being said, the units in which the PX747-4K are compared to in these situations tend to cost much more, so such issues might just come with the budget projector territory. Confusing button layout on remote: A backlit remote is a great addition, but it is somewhat undermined by a weird button layout. The on button is coloured red, while the off button is coloured green… need we say more? A closer look at the ViewSonic PX747-4K can make it feel like a mixed bag of a projector. For those who are dead-set on getting near 4K resolution on the tightest budget possible, this projector is still a great option. On the other side of things, those who are able to spend a bit more money on a projector might want to look elsewhere. With this in mind, we have prescribed some alternatives to the ViewSonic PX747-4K projector below. What Is A Good Alternative To The ViewSonic PX747-4K? For starters, those who are still hoping for a budget projector but haven’t been able to fall in love with the ViewSonic PX747-4K may want to give the ViewSonic PX727-4K a passing glance. While it offers many of the same specs, it is just different enough to warrant a second look for those who are serious about keeping to a budget of approximately $1,000. If you are wanting to look at projectors from another manufacturer, we suggest starting with the BenQ TK800 4K projector. This unit is another budget-friendly offering that showcases many of the benefits that affordable projectors can offer while avoiding many of the silly downsides associated with the ViewSonic PX747-4K model. Better yet, the BenQ TK800 4K projector offers 3D content capabilities, which is not provided with the ViewSonic PX747-4K. Those shopping for a new projector should ensure that they are 100% satisfied with their selection before making a significant investment in such a product. With so many different projectors from dozens of manufacturers, we are confident that you will find the right option that aligns with your personal taste and budget. We encourage you to take your time, keep an open mind, and continue to search until you find the perfect projector for your needs. The ViewSonic PX747-4K is an excellent option for those who want to stick with a shoestring projector budget. However, the weird quirks and annoying omissions by the team at ViewSonic make us hesitate to suggest this product to anyone outside of that category. The price of near 4K and true 4K projectors is continuing to drop steadily, which means that great deals can be had on far more capable projectors if you are patient and do some research on what is out there. Outside of the quirky nature of the ViewSonic PX747-4K, it is essential to consider the fact that this is a standard throw projector, which means you’re going to need a lot of space between the projector and its associated screen to get it to function as intended. This fact further narrows the category of consumers that will get the best use out of the ViewSonic PX747-4K significantly. 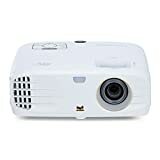 Overall, it is a great budget projector for a very specific section of potential customers, but outside of that, it is not much to consider, especially when far better projectors can be had at a similar price when they go on sale.